Electrician -112 Posts, Painter (G)-12 Posts.Total-492. Electrician -28 Posts, Painter (G)-03 Posts.Total-123 Posts. Age as on 01.07.2015-15 to 24 years. Qualification for Point No. 1(B) of this Notification-Matriculation/10th class. Mode of selection-No written test. 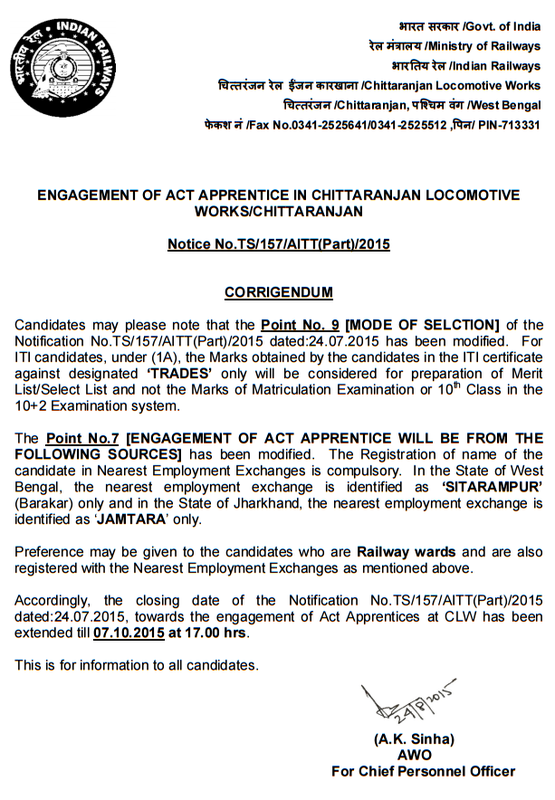 Address for application-The Principal, Technical Training Centre, CLW / Chittaranjan, P.O. – Chittaranjan, District – Bardhaman (West Bengal), Pin Code-713331. Application fee-Rs.100/- only.No application fee for SC/ST/PH/Ex. Service Man, Women, Minorities & Economically backward classes.